I really enjoyed the many bits and pieces of humor that is a somewhat tamed version found in Gantos’ earlier works. The characters are more eccentric than completely out of control (with perhaps a couple of exceptions.) Most of them are quite endearing and are what hold the story together and pull me through — especially Ms Volker and Jack the first person narrator. Jack’s narrative voice is so lighthearted that the deaths and destruction simply don’t seem that dire. The mystery aspect only gains momentum toward the very end of the tale and the resolution is fairly uneventful, in keeping with the tone of the rest of the book. Jack Gantos puts himself into the story as the 14-year-old boy narrator. 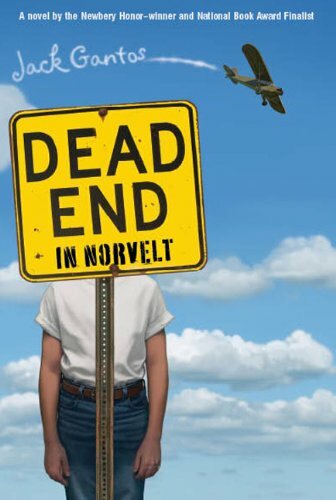 It is set against the Cold War era, in a little town called Norvelt (established by Eleanor Roosevelt during the Depression.) The old folks are dying (somehow mysteriously and rapidly,) the young people are leaving town, the children are bored. The narrative voice is a sweet one – an earnest and nose-bleeding (there is A LOT of it in the book) boy whose life is both trapped by reality and freed by innovative imagining and by helping with an old woman who’s the town paper’s obituary writer and an inventive historian herself.